Remove the beet greens, leaving about 1 inch of stem. 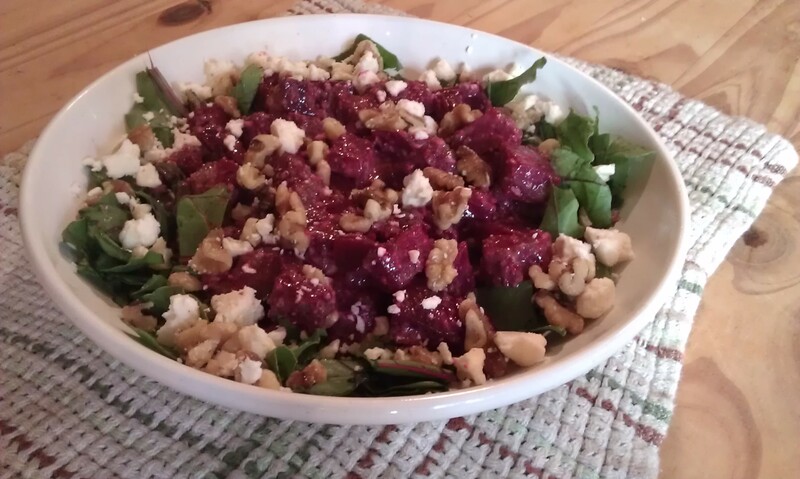 Coarsely chop the beet greens and refrigerate. Place the beets in a baking dish and add the water. Cover tightly with foil and bake in a preheated 425 oven for about 45 minutes or until you can easily pierce the beets with a knife. Cool slightly. Use a paper towel to remove the skins. Slice or cube the beets. Prepare the sage pesto adding the balsamic vinegar and sugar/honey/sweetener. Pour the pesto/vinaigrette over the beets, cover and let sit at room temperature for at least 1/2 hour. Toss with the beet greens. Sprinkle with feta and walnuts. Combine all ingredients in a blender or small food processor, and run until the mixture resembles a coarse paste. Transfer to a small dish and if not using immediately, refrigerate.